Sierra Leone is a country endowed with mineral resources but the amount of revenue that has been generated from the sector has been quite low. My research focuses on mining taxation, specifically in trying to understand why revenue from the mineral sector has been very low. In 2013 when I left Sierra Leone, iron ore production had resumed in 2011, there was a smooth general election in 2012 and growth prospects looked good over the Franklin Bendumedium term. The outbreak of the Ebola Viral Disease (EVD) in Sierra Leone, Guinea and Liberia in April of 2014 changed the economic landscape of these countries. In Sierra Leone, economic growth rates, exports of minerals and revenue projections have been revised downwards. By the time I arrived for my fieldwork in June, 2015, the EVD had claimed the lives of over 4,000 people in the country. The outbreak also exposed the decaying health system of the country given that, at time of the outbreak, the country had only one testing centre that was operated by an international non-governmental organization. Even though I had been following developments about the EVD, I was not prepared for the changes that this disease had brought on the day-to-day lives of people in the country. In Sierra Leone, despite the high level of poverty, people walk around with a smile and social interaction is very much a national pastime. The outbreak of the EVD has brought about a lot of change in the way people interact. Arriving in Freetown, I was confronted with the challenge of how to go about my fieldwork in the most effective and safe way. How could I move within the city whilst at the same time limiting physical contact? Which offices should I visit to get information? As a researcher, moving around to get information is crucial, but the EVD made doing so extremely challenging. Moving around Freetown is never easy because of the limited number of alternative routes and high population density. Now, to reduce body contact, the number of passengers allowed in a taxi was reduced from four to three. Travelling became even more time consuming. The EVD also affected work pattern as people spent less time in their offices, returning home earlier than the normal. In fact, some of my interviews had to be conducted at the homes of officials as that was the only way I would get them to allocate time for me. In all Freetown offices, the presence of a bucket of chlorine, hand wash sanitizers and security guards with thermometers became part of the set-up. People were required to wash their hands and have their temperature checked before entering. I was not told what temperature level would be a cause for alarm but my readings were, fortunately, always between 34˚C and 37˚C. Also within offices, I noticed that the formal dress code had changed as workers adopted long-sleeved clothing as a means of limiting body interaction. Formal greetings were now achieved by placing the right hand to the heart or by touching elbows (that is, if you are wearing a long sleeve shirt). This replaced the former firm hand shake and embrace. Other changes since the EVD outbreak included a national hotline to report suspected cases of Ebola or the death of an individual. The government became responsible for burying the dead at designated burial sites, whether the death was Ebola-related or not. In addition, with the help of the international community, new testing sites were established in Freetown. The continuation of traditional burial rites. 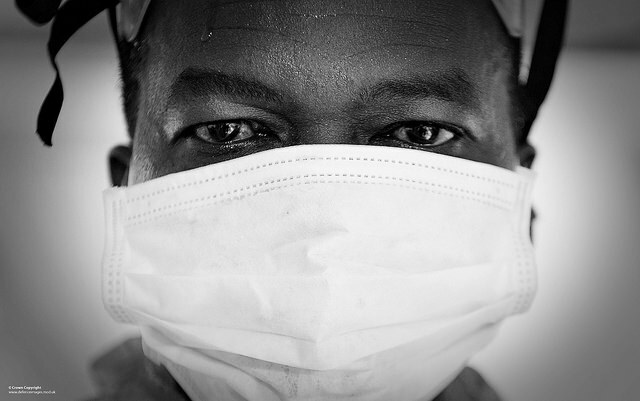 Even though the EVD is a health issue, it has brought with it adverse economic consequences. Commercial activities, especially informal-sector activities, have been severely affected. Businesses now close down at 6pm and all commercial activities are banned on Sundays. There have been redundancies for some private-sector employees and informal-sector activities have been hit the hardest. The cost of living has gone up as the prices of basic commodities have increased with no proportionate increase in income. It is now expensive to import goods into Freetown (due to the increase in insurance cost) and this is translated into price increases for basic goods as the country relies on the importation of most consumer goods. Some private-sector employers have made staff redundant or requested that they stay at home without salary until there is a turnaround in business. It was difficult to see colleagues who were employed before the outbreak of the EVD, but who have now been unemployed for several months. The fieldwork gave me the opportunity to interact with the various stakeholders in the mineral sector and a thorough insight into how politics, corruption and the civil conflict have affected the development of the sector. As I left Freetown, I looked forward to the 42-day countdown and the eventual declaration of an Ebola-free country.